To mark International Women's Day on 8 March, Jaguar Land Rover celebrated the many inspirational women that make up a key part of its workforce. The EMC's Colleen Evans shares her story. Growing up in South Wales, EMC IPS lead Colleen Evans was always fixings things as a child. Her dad, a former merchant navy engineer, was left a paraplegic after a serious motorcycle accident. He used every challenge as an opportunity for her to learn something new. From the age of eight and after her brother left home and her parent’s marriage broke down, Colleen was the main fixer in the family home, a role that she relished, although she admits it meant she had to grow up quite quickly. It wasn’t until later in life and when Colleen had her own family that she realised her passion for engineering. She was helping her son, Daniel choose his GCSEs, flicking through the subjects, she realised, like her son, she had an interest in maths and science. She began to think it would also be a great career move for her. A conversation with her husband, led to a visit to an Open University fair, where she signed up for a degree in engineering. 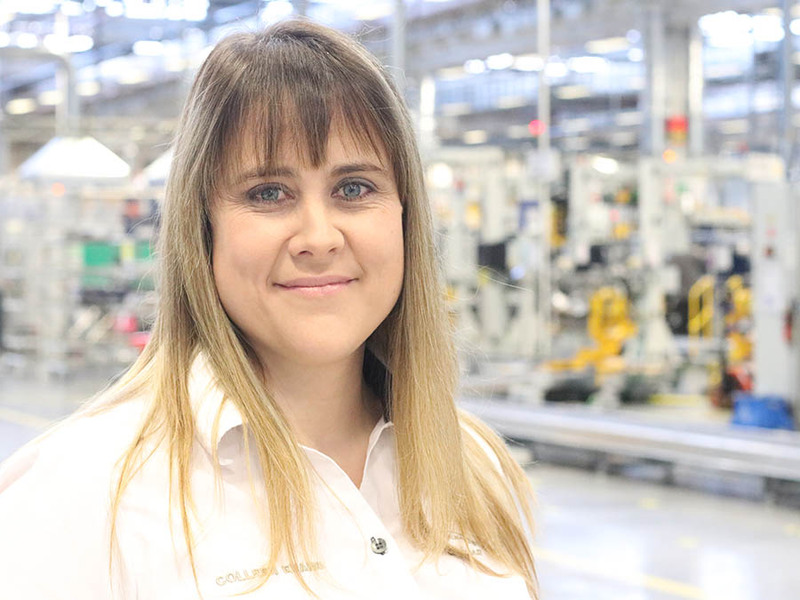 Fast forward a few years and following a stint at Ford’s Bridgend facility, she joined the EMC in the MP&L team. Colleen took on a new career, whilst also continuing her degree. “When I joined the EMC I was still living in Wales and I was half way through a house renovation. I used to spend the week in Wolverhampton and then travel back to Wales to spend the weekend on the refurbishment. It took about a year, but mid-way through 2018 we sold our house and moved. “I’m due to finish my degree this September, it’s been incredibly hard, but it will support me in my own career ambitions. Perhaps in Launch, or Ops. “I think more people, especially women and young girls would come into engineering and manufacturing if they understood and realised how varied the discipline is. I think it’s hugely important to inspire the next generation of engineers. I support events in the EMC Education Business Partnership Centre and always liken engineering to a tree. It has a core, roots and trunk, but then branches and leaves, which represent the many different and varied disciplines.